Facebook works hard to maintain Mark Zuckerberg’s public image. Professional photographers take staged photographs, like these images of him visiting a Facebook data center, petting a calf, and meeting with world leaders. A team of employees diligently manage his Facebook page. But the most frantic display we’ve seen yet was Facebook’s effort during this week’s trial in a Dallas federal courtroom, where Zuck testified in a $2 billion intellectual property lawsuit against the company. Except for an extremely short video clip caught by CNBC, nobody was able to snag a picture of Zuckerberg Tuesday when he arrived at Earle Cabell Federal Courthouse. Scores of media armed with cameras lined the exits to the building, in hopes of getting a shot of the Facebook founder leaving court. Unlike Palmer Luckey and John Carmack, other senior Facebook employees who also testified, the moment Zuck finished his testimony he was escorted out of the courtroom by his security team and Facebook public relations handlers. I followed, and one of Zuck’s bodyguards went of of his way to push me away from Zuck’s 10-person-deep protective bubble. Hey man, I was just trying to ask a question! Once Zuck had been escorted down the hallway towards the legal war rooms, which Facebook’s lawyers and employees occupied during breaks in proceedings, court security wardened off the area. The bathroom that had previously been open during breaks in the trial was now blocked off, and Zuck’s security team demanded that I stay out of eyesight. Eventually, Zuck was escorted to a private elevator typically used for courthouse judges, and three black Chevy Tahoes peeled out of a exit at the back of the courthouse. If you squint you can see the faint aura of Zuck in the driveway. 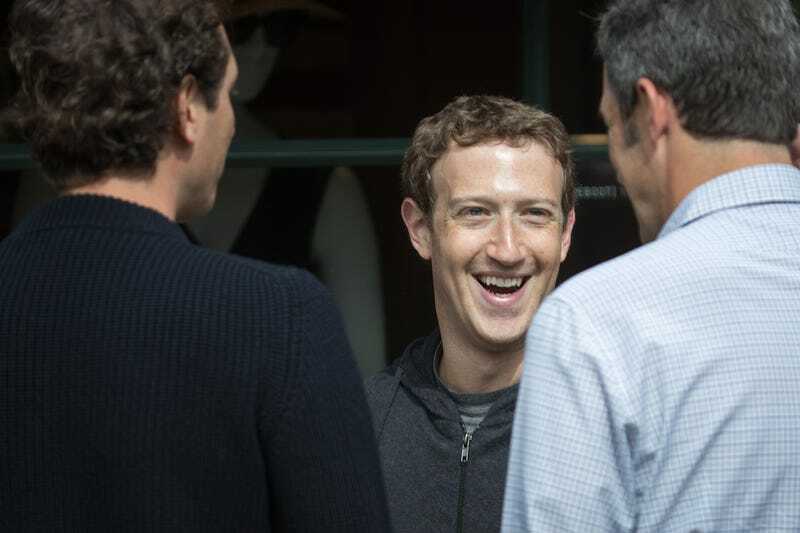 Later that day, Zuck slipped out of his suit and tie and back into his classic jeans and t-shirt to visit Facebook’s new data center in Fort Worth (did you know 43 percent of its employees are veterans?) and then visited a rodeo. How charming! Indeed, getting a photo of anyone at the court, including of the reclusive Luckey or CTO Carmack, proved to be extremely difficult. The judge even joked that he would personally destroy the phone of anyone who tried to take a picture inside the court. It seemed Facebook had thought of everything. After proceedings ended on Wednesday, the best chance to get a question in or a photo of Facebook royalty (Luckey had been giving testimony most of the day) was back at their posh hotel, just a few steps away from the courthouse. Unfortunately, a Facebook lawyer had come ahead of the group at the end of the day and frantically started tapping at his phone and making calls as soon as he saw me. Eventually, he got hotel staff to tell me get lost. Having been there myself, I can tell you that Zuckerberg and crew looked pretty dapper when they showed up to court this week in stylish suits. But for some reason, they didn’t want you to see it.